People have told harrowing tales of hearing the screams of those trapped in Grenfell Tower as the blaze ripped through the building. Eyewitness Daniel told BBC London: "They were trapped. They couldn't come downstairs, especially from the top floor … people have been burned. Zoe, who lives on the fourth floor of the block, said: "Someone started banging on my door saying there's a fire and to get out. "When I got on the landing it was thick with smoke but the smoke alarms weren't going off, which is quite scary. "Then I just ran down the stairs. You could see the fire is in one of the flats. "They were saying apparently the fire was caused by a fridge freezer, don't know how true that it is but the way the fire spread from the fourth floor all the way up was just scary. "When we got downstairs we were seeing people in the building flashing their kitchen lights, bedroom lights trying to get everyone's attention." 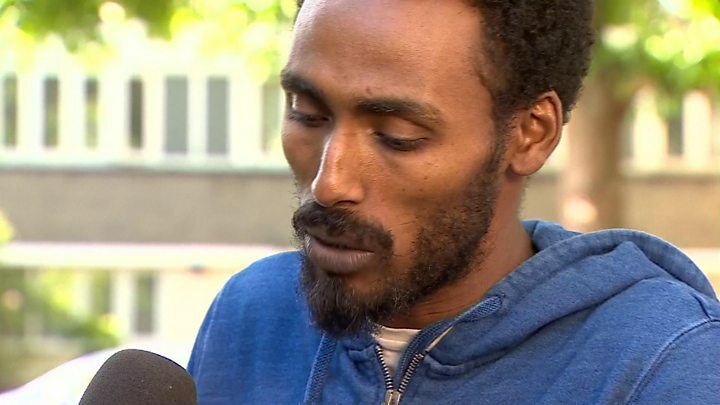 Mahad Egal escaped from his flat on the fourth floor with his family, including two small children, just before 01:00 BST. He broke down as he recounted the events of the night on the BBC's Victoria Derbyshire show. "At first it seemed it was controllable, but really quickly the fire started to rise as the cladding caught fire, " he said. "The stairwells were full of smoke, dark, scary, and a trip hazard and fall hazard as some lights weren't working. It is incredible we survived. "So many people were left; we had so many relatives and families who were ,still trapped in, calling and saying please let the fire services know that we ,are still here. "There were people jumping out of the place, a man who threw two of his children out." Zach Leeks lives a few minutes from the tower. He was woken at 06:00 by a friend concerned for his safety. He told Radio 5live: "I went into the garden and there was just foam and ash and charred remains all over the garden. I just put some shoes on and went and did as much as I could. "The people who have woken up at the same time I have, have relieved the people who were here all night. "It's a lot to take in. It's very emotional. It was very silent down here. People were in shock. I'm still shaking here now. "There are local builders here who are bringing supplies - water, clothing, bedding. I've never seen this place pull together so much since I've lived around here. "It's extremely emotional. This is going to ruin a lot of people's lives." 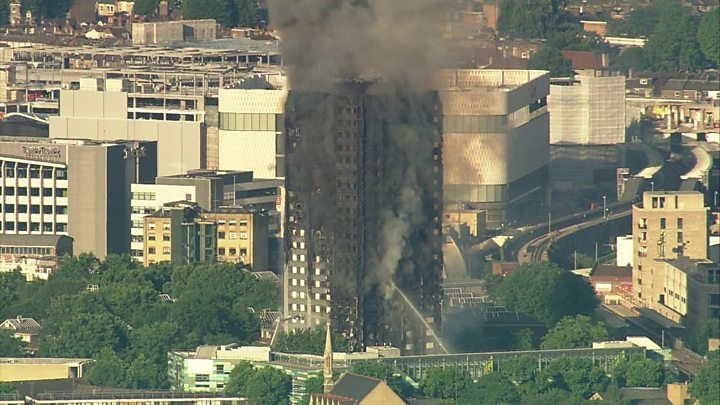 "I woke up about half past one this morning to look across the road and see the big Grenfell Tower, in a towering inferno, just fire coming out of every window... smashing and exploding," said Paul Littlejohn, who lives opposite the tower. "Things falling out, people screaming, people jumping out on fire, chucking ropes down what they'd made out of bed sheets, to try and climb out. "Just a complete nightmare, absolute nightmare." A panicked parent was seen throwing her children from a window in the block shortly after 02:00, one witness said. Joe Walsh, 58, said: "I saw the parent throw two kids out of the window. "I don't know where they landed because I was on the other side. "I doubt anyone caught them, I hope they did." Image caption Tiago Etienne said the screaming was "loud" and "terrible"
Student Tiago Etienne, 17, said he saw people drop from around the 15th floor but it was hard to tell in the darkness of the early hours. "I saw about three children between the ages of four and eight being thrown," he said. He said he thought they were being sent down to firefighters because they were not letting the civilians who were there get close. The screams of the residents had alerted him to the fire. He added: "I could hear the screaming. "From where I was it sounded like people were directly outside. "It was loud. It was terrible." Samira Lamrani said she saw a member of the public catch a baby thrown from the ninth or tenth floor. "People were starting to appear at the windows, frantically banging and screaming. "The windows were slightly ajar, a woman was gesturing that she was about to throw her baby and if somebody could catch [it]. Ms Lamrani described how she could see people "from all angles" banging on the glass for help. "Members of the public were reassuring them, telling them we've done what we can and that we've phoned 999, but obviously the look on their face was death. "My daughter's friend said she observed an adult who made some sort of homemade parachute and tried to lower himself out of the window. "The more I looked up, floor upon floor. Endless numbers of people. Mainly the kids, because obviously their voices, with their high pitched voices - that will remain with me for a long time." Jody Martin said he got to the scene just as the first fire engine was arriving. "I watched one person falling out, I watched another woman holding her baby out the window... hearing screams," he said. "I was yelling everyone to get down and they were saying 'we can't leave our apartments, the smoke is too bad on the corridors'." "And they were screaming back at me: 'We can't. The corridors are full of smoke'"
Neighbour Tamara said when she got there the whole right side of the building was on fire. "The whole thing was engulfed in flames. We could hear people screaming 'help me' so me and my brother ran over to the estate and there were people just throwing their kids out saying 'save my children'," she said. 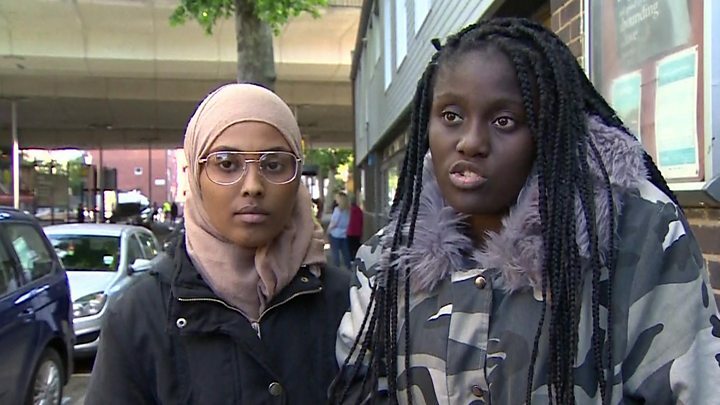 "The fire crew, ambulance and police couldn't do anything, they couldn't get in, and they were just telling them to stay where they are, and we'll come and get you. "But things quickly escalated beyond measure and they couldn't go back in and get them. "Within another 15 minutes the whole thing was up in flames and there were still people at their windows shouting 'help me'. "You could see the fire going into their houses and engulfing the last room that they were in." Ann Waters lives in a house at the foot of the tower and was forced to flee her home when burning debris began raining down. The 57-year-old said she was in bed when she smelled smoke and heard a fire engine. "It was the screaming that was the worst and I could hear that from the ground, all I could hear was 'help, help, help'," she said. "I was just speechless, the guy next door was screaming at people to get out of the building. "When I went out the front I could see all the debris coming down and I could see [it] coming down and a police officer told me to... leave and go to the end of the road. "It was like something out of a nightmare."